If you have any prayer requests, please send an email to parish@santuariodesanjose.com and we will post it to be prayed over. Early in the morning in 2012, a rescue team member of the Metro Manila Development Authority knocked at the door of Bro. Joey Barrameda. Dave, his 25-year-old son, was brought to the emergency ward at the Jose Reyes Memorial Hospital. He was in very serious condition. He was victim of a hit-and-run incident wherein he was thrown off the motorcycle he was driving by a car which severely damaged his hip bones. “Lord, ligtas mo po siya. (Lord, save him.) Have mercy on my son.” The first words from Bro. Joey when he heard the news. He proceeded to pray the Divine Mercy. When he saw his son and his condition at the hospital, he looked for a chapel and prayed hard to Saint Joseph. Doctors told him to wait for 24-hours to determine if his son would survive. His blood pressure reading was 60/40. His son survived the ordeal. After several tests, doctors found out that he had broken hip bones and had to be operated on the next day. The next day, before the operation was to be held, additional tests were taken. And doctors declared: no need for the operation. The hip bones were in order. His son was later transferred to the Veterans Memorial Hospital. Again, tests were conducted and surprisingly, doctors found out that there were fractures that needed to be operated on . Once again, tests were done before the operation. For the second time, doctors would find out that there would be no need for an operation. During these trying times, Bro. Joey relied only on trust in God. Praying before the Adoration Chapel and going to Mass daily, he prayed for his son. “Ask and you shall receive…” God had provided. 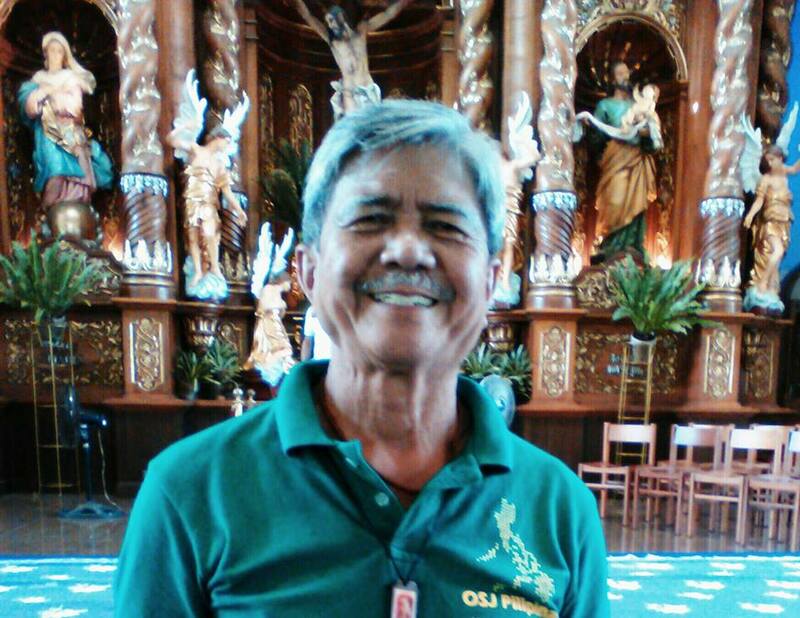 With the financial assistance from the Men of St. Joseph, his son’s ordeal was overcome. Three months after the accident, Dave was discharged from the hospital. Today, at 29, he has started to run again for the marathon. Bro. Joey believes that this miraculous healing was granted through the intercession of St. Joseph. With 100 percent trust in God, he says that he did not waiver in his faith and was always at peace despite the condition of his son. God did not disappoint him. One day, Bro. Genie “Boy” Lindo was strolling in Greenhills area. Then, he heard a soft whisper : “Simba ka ( Go to Mass).” Right away, he went to Mass at the Holy Family Chapel in Greenhills Shopping Center. Providentially, the noon Mass was being celebrated. That was in2006. Since then, he has been going to daily Mass. Prior to this spiritual experience, Bro. Boy admitted to being somehow a little abusive toward his wife, Soledad, especially when he got home drunk. This, of course, stopped . But, a homily on the Gospel passage from Mark 1:15, “…repent and believe in the gospel…” would be a life changer. He had what spiritual writers would call a “metanoia.” There would be no turning back for Bro. Boy. He would change for good. This change would be further intensified when he joined the Men of St. Joseph. To engage himself in the service of the Lord, he formed the MSJ choir of the Immaculate Conception Chapel “Hindi naman maganda ang boses ko pero …( I don’t have a good voice but…). He wants to sing for the Lord. Bro. Boy is father to six grown up children: five boys and one girl. All of whom have served the Lord in their communities, either as members of Singles for Christ or Couples for Christ (CFC) . His wife is a member of the Handmaids of the Lord of CFC. God has been good to the family. His favorite Gospel passage: “Lumapit kayo sa akin, kayong lahat na nahihirapan at nabibigatang lubha sa inyong pasanin, at kayo’y bibigyan ko ng kapahingahan.” Mateo 11:28. Indeed, Bro. Boy has discovered a life of peace with God.